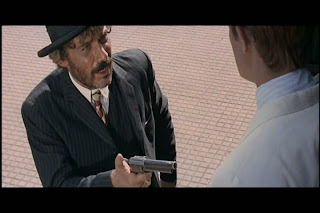 “Senor, you are an American? You like Mexico?” asks a chipper Hispanic boy. Bill Tate, jaded anti-hero of “A Bullet for the General” (1967), looks down at the smiling youth. It’s tough to imagine a more joyless and Machiavellian protagonist than Tate, a ruthless bounty hunter who makes similar characters in other spaghetti westerns look downright noble. Perhaps it’s because “A Bullet for the General” was early in a wave of Zapata westerns, a subgenre of spaghetti westerns with much more overtly Marxist underpinnings and extremely dark worldviews. Set during the Mexican Revolution in 1913, Damiano Damiani’s film is at once a shameless action buddy flick and a daring social critique of capitalism. 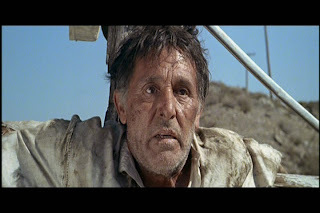 The film stars Lou Castel as bounty hunter Tate and El Chucho (Gian Maria Volontè, villain of the Leone’s Dollars Trilogy) as a Mexican bandit who frees him from the police while robbing a train. The two become fast friends, although Chucho doesn’t know that Tate’s rescue was staged as the first act in his play for 100,000 pesos. Tate is merely manipulating Chucho to get close to General Elias, the leader of the Mexican revolution. In his valise is a golden rifle bullet, which if properly applied to the right political skull, could make Tate a very rich man indeed. It would also forever end the dreams of closet-revolutionary Chucho and the oppressed Mexican peasantry. 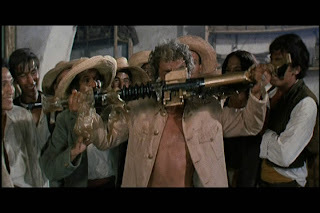 Though the film opens with Tate blankly watching a firing squad gun down a batch of scraggly Mexican revolutionaries, its politics remain largely submerged within the action set pieces and character dynamics for the first 2/3. 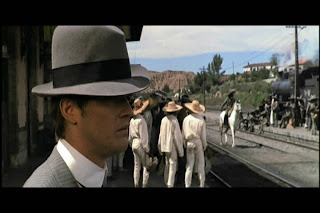 The early train robbery scene is a masterpiece of upping-the-ante on traditional westerns. The conductor pulls the engine to a stop as he comes into sight of an obstruction on the tracks: a crucified military captain still barely alive. Anyone who tries to help him is gunned down by the encircling bandits. Chucho is in charge of the attackers, and soon has the passengers riddled to rags with gunfire. Tate cuffs himself a dead soldier’s manacles and allows himself to be taken in by the thugs. They’re pleased to have what they presume to be an American outlaw in their company. 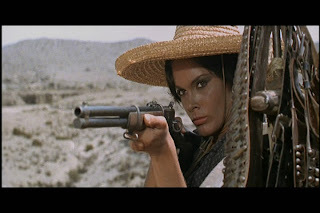 Chucho’s gang includes the beautiful Adelita (Martine Beswick) and Chucho’s idealist brother El Santo (Klaus Kinski). When Kinski is playing the moral anchor and most sympathetic character in the movie, you know you’re in for nihilistic fun! Tate offers to help them bandits slaughter the government forces and gather arms to sell to the revolutionaries. Chucho becomes enamored with the idea of holding out in a poor town with their stock of weapons and volunteers, but his greedier pals don’t want to risk their lives without a clear profit to be made. 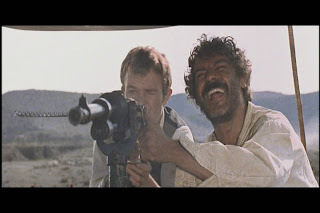 When Chucho discovers a brand new machine gun, Tate decides to steal the weapon to lure the Mexican onward to the general. The two lead men show plenty of chemistry, actually enhanced by the audience’s knowledge that Tate isn’t on the level and that both of the men are merciless killers. Chucho is enthusiastic and not very bright, an easy target for Tate’s manipulation, but the Gringo clearly warms to the companionship and brotherhood that Chucho offers. When Chucho finds Tate’s golden bullet, the bounty hunter claims it’s a lucky charm. The viewer can feel that their luck is soon to go down hill. True to his hopes, the wagon full of rifles topped by the machine gun fetches a mouthwatering sum of $5000 for the small-thinking Chucho. He has fooled himself so well into thinking that he has supported the revolution with all his might that he is brought low when General Elias confronts him about abandoning the village. Apparently, the ill-trained, ill-equipped men that Chucho left behind were slaughtered in his absence. His brother Santo survived, and now jumps at the chance of getting his revenge. Chucho is so depressed and penitent that he agrees to be executed in the wasteland behind the camp. Meanwhile Tate loads his rifle on a nearby hillside. Chucho hears the first gunshot, but it’s the second one that catches his attention when it kills his brother. Though his life has been saved, Chucho is bereft and stumbles back towards the revolutionary camp in a daze. The second bit of bad news hits him even harder: General Elias was assassinated by the first bullet. Jump ahead to some time later and we see Tate collecting his bounty in gold (he turns down the paper money saying it’s “not the same.”) and returning to a fancy hotel. A drunk and distraught Chucho breaks in planning to kill his former friend, but Tate reveals that he has been waiting for him for several days. Tate is genuinely happy to see the only friend he ever made and readily splits the money with Chucho. In a state of shock, Chucho allows himself to be bathed, dressed and fed like a rich man. 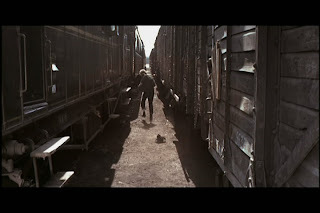 Tate wants to take him up to the United States, but as he waits in the train station for Tate to buy the tickets, he begins to question his position. 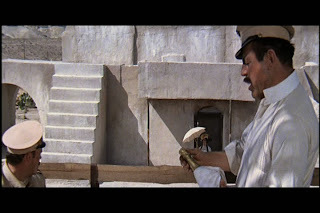 He gives a coin to a poor shoeshiner and tells him to “buy bread” and suddenly feels the guilt of his ill-got wealth. The train starts to pull out with Tate trying to pull Chucho onboard, but the Mexican finally realizes he must do something he doesn’t understand. “I have to kill you, Nino.” “Why?” “I don’t know, Nino. I only know I have to kill you.” And he does. 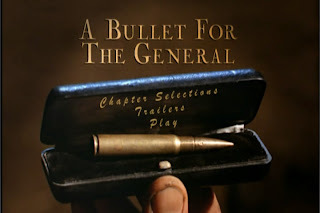 On the most superficial level, “A Bullet for the General” is an excellent revisionist western with regularly spaced action sequences that are clever and thrilling. Damiani knows exactly what additive touch will send a scene from cliché to inspired. Blowing a hole into a police fort by hiding explosives in a prostitute’s luggage too mundane? 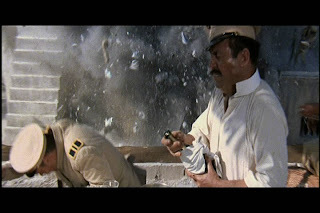 Why not synchronize the explosion with a cork popping off and have the prostitute take cover beneath her dainty parasol! There’s a rambunctious caprice throughout the film that goes beyond mere violence and destruction. The film seems determined to have a good time and enjoy the ride no matter how despicable the murder, mayhem and manipulation may get. 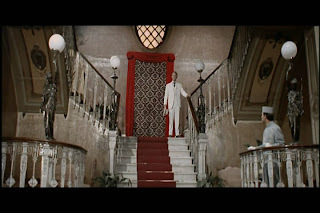 The visuals aren’t as over the top as other Italian features, but the gliding, striding camera work is clearly propelled by the same sense of excitement and destiny. The score by Luis Bacalov and Ennio Morricone also lives up to the energetic pitch, with some of the genre’s most memorable tracks. On a deeper level, the film manages to show the balance between friendship, greed and political idealism. 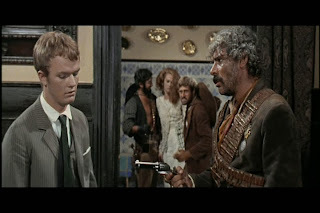 Unlike the Dollars Trilogy or the Django and Ringo characters, some serious consideration is given to the choices and consequences that Tate and Chucho live with. Tate certainly has the ice cold cynicism and premeditated betrayal that fans of amoral hired gunmen expect, but he is also human enough to respond to Chucho’s infectious extroversion. That the bounty hunter’s isolationist veneer masks a loneliness not fully satisfied by gold, make him only slightly less evil and quite significantly more interesting. It also sets up Chucho for a devastating inner struggle and ultimately leads to the unforgettable ending. So whether you’re a fan of spaghetti westerns, buddy movies, dark anti-heroes, Marxist politics, moral crises or sprawling epics, this is a film that deserves your viewing. I agree with Katie that one has to distinguish between brands of westerns. 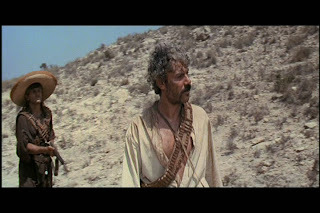 There are a very few classic ones I like (only one by the highly overrated Ford), but I love spaghetti westerns and many American revisionist ones. 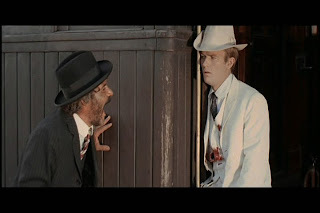 My taste runs towards the ones that broke out of the typical mold: El Topo, Dead Man, Lone Star, Django, Johnny Guitar, My Name is Nobody, etc. However, these are some classics I enjoy: Treasure of the Sierra Madre, High Noon, The Ox-Bow Incident, Bad Day at Black Rock, Rio Bravo and The Man Who Shot Liberty Valance. To be honest though, I've seen less westerns than almost any other major genre. I tried to put together I top 100, and didn't have enough canindates! Oh well, some other day. The only one I thought was charming was The Outlaw Josey Wales. I found the political elements to be horribly dated, though this made for an interesting time capsule - I guess even 5 years later with Italy being in the grip of the Red Brigades this kind of movie simply couldn't have been made at all. Ignoring all circumstances, I still find the ending to be a cop-out - having Chuco either getting on the train or getting killed by Tate would have been much more fitting. I think the politics are a little dated, too, especially since they are treated so flippantly and without really looking at the practical aspects of both the revolutionary and mercenery orginazations. My own lack of historical background, however, allows me to enjoy the action more as a purely narrative vehicle. As for the ending, I love it exactly because it is not what you'd expect. It soars off into a flight of fancy (and in that sense it is a cop-out), but in so doing, it transcends the safety of the hopeful/hopeless dichotomy. For me, the political message is complicated here by the victory of anarchy over either communism or capitalism.